A blog post aggregator bringing together React developers from across the globe. How do I add my feed? Send a pull request for the subscriptions.json file. We're glad to have you on the feed! 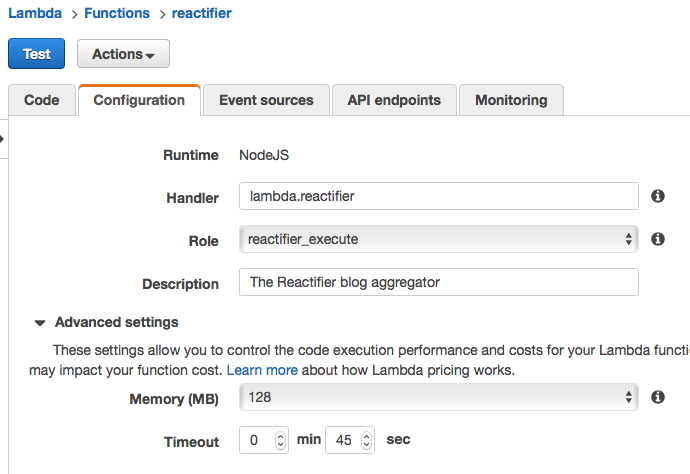 Reactifier is run as an AWS Lambda function. The compiled code and dependencies are zipped up and uploaded to AWS to be triggered as a Scheduled Event every hour. AWS executes the default export on the lambda.js module, which calls the reactifier() function. The function pulls down all subscribed RSS feeds based on the subscriptions.json file. After the latest posts are retrieved, a static site is generated to display the post previews and provide an RSS feed. The static site is hosted entirely through S3. What does the AWS Lambda configuration look like?